A delicious strawberry banana with sweet vanilla milk and cream undertones topped with a fresh whipped cream. Strawberry & ripe strawberry these flavors combined give you that pink flavor a nice fresh strawberry slightly artificial but just right. Banana cream gives you a nice fresh banana flavor not to ripe but just fits well into the creams. Sweet cream, Bavarian cream, cheesecake graham crust, vanilla swirl, and the vanilla custard make up that rich vanilla milky cream. Sweet cream and the cheesecake graham gives it that dairy flavor while the Bavarian cream and vanilla swirl add in the vanilla along with the vanilla custard which also adds weight and holds everything together in this recipe. Lastly the whipped cream is just used as a topping. 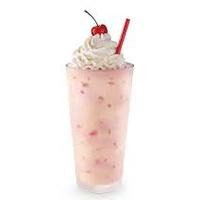 Picture a strawberry banana milkshake glass with that whipped cream on top that's exactly what it is there for just to finish it off. Tried to keep this recipe using only tfa but capella vanilla custard v1 works better in my opinion but tfa vanilla custard will do fine. This stays in my ADV rotation, which is rare because I have a love/hate thing with banana vapes. This one is superbly balanced if you give it the right amount of heat. Absolutely amazing recipe, sweet Creamy strawberry vanilla inhale and a very Ripe and rich banana exhale with a lot of body. Congratulations! Really good recipe, definitely needs at least a 5 day steep before trying. Been enjoying this mix for a few days now. Creamy fruity strawberry on the inhale and a meaty, creamy banana on the exhale. I waited the 5 days steep and used cap vc1. I like it. So many recipes go unrated. Didn't want it to get lost In the shuffle so others might give it a try.